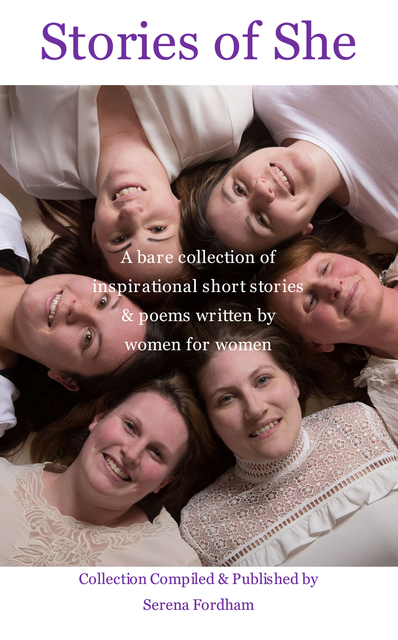 Created by 13 incredible women, Stories of She is a bare collection of tragic and heart-warming short stories and poems, written by women to inspire women. With the cover showing some of the writers as 'bare faced and beautiful' (wearing no make up and not airbrushed in any way), this collection provides an uplifting and positive read for women of all ages. The strength of the talented writers shines through, and it hoped that this strength can inspire other women to be courageous when facing similar struggles. If confronted with the same problems or challenges, the reader is able to relate to the issues raised in the book, and can find some assurance, guidance and comfort that difficult experiences can be overcome. Contained is also a directory of useful contacts that can provide support and advice if appropriate. Stories of She is in association with Her Business Brew women's networking group and Inspired Women, and will raise funds for Break and Nelson's Journey.